魏强(1974-), 男(汉族), 甘肃省渭源县人, 硕士, 研究员, 主要从事森林生态研究。E-mail:1974weiqiang@163.com. 第一作者：魏强(1974-), 男(汉族), 甘肃省渭源县人, 硕士, 研究员, 主要从事森林生态研究。E-mail:1974weiqiang@163.com. Abstract: [Objective] To study the decomposition rate of litter leaf and investigate the relationship between litter decomposition rate and their initial quality in order to provide a scientific basis for forest ecosystem material circulation research in Xinglong Mountain of Gansu Province. [Methods] A field litterbag experiment was conducted in Xinglong Mountain from 2013 to 2016. Litter leaf of three main tree species including Picea wilsonii, Populus davidiana and Betula platyphylla was taken as the research object. Samples of litterbags were retrieved at May, August and November in every year. The litter decomposition rate and their initial quality were studyed. The relationship between litter decomposition rate and their initial quality were clarified. [Results] The leaf decomposition rate of P.wilsonii in middle aged forest was 0.16, and the 95% decomposition period was 19.08 a. The leaf decomposition rate of P.wilsonii in pre-mature forest was 0.13, and the 95% decomposition period was 23.70 a. The decomposition rate of litter leaf for P.davidiana and B.platyphylla was 0.11, and the 95% decomposition period was 28.57 a and 27.27 a, respectively. The decomposition rate of litter leaves of P.davidiana and B.platyphylla was significantly lower than that of the needle leaf of P.wilsonii, which was probably due to the home-field advantage of litter decomposition and smaller aperture of decomposition bags. The litter decomposition rate was positively correlated with N content, but negatively correlated with lignin content, C/N value, lignin/N and K conten. 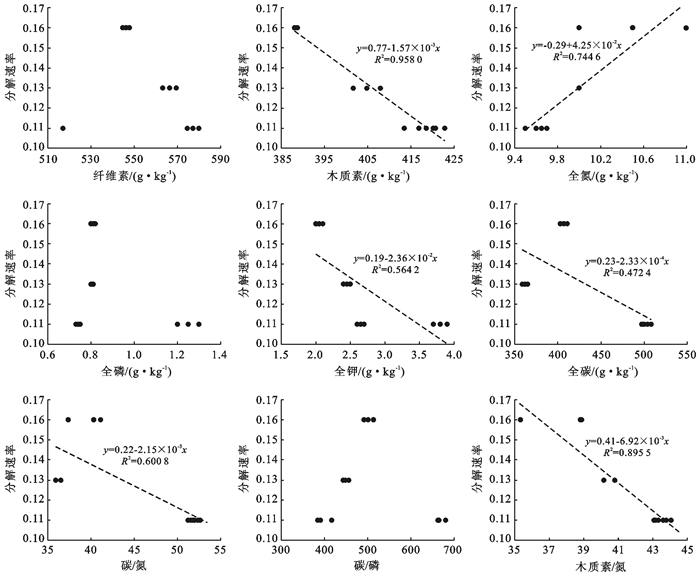 Especially, for lignin content, N content and lignin/N values, the correlation coefficients were above 0.7 000. K content, content of lignin, lignin/N, C/P and cellulose content were key indicators affecting the decomposition rate of forest litter in Xinglong Mountain. [Conclusion] Lignin/N is a key quality indicator affecting litter decomposition rate. The higher the initial lignin/N value of litter leaves, the lower the decomposition rate. 马玉珠, 程栋梁, 钟全林, 等. 中国森林凋落物不同组分异速比例关系[J]. 植物生态学报, 2013, 37(12): 1071-1079. 杨万勤, 邓仁菊, 张健. 森林凋落物分解及其对全球气候变化的响应[J]. 应用生态学报, 2007, 18(12): 2889-2895. 杨林, 邓长春, 陈亚梅, 等. 川西高山林线交错带凋落叶分解速率与初始质量的关系[J]. 应用生态学报, 2015, 26(12): 3602-3610. Swift M J, Heal O W, Anderson J M. Decomposition in Terrestrial Ecosystems[M]. California: University of California Press, 1979: 1-10. Berg B, McClaugherty C. Plant litter: Decomposition, Humus Formation, Carbon Sequestration[M]. New York: Springer-Verlag Berlin Heidelberg, 2014. 唐仕姗, 杨万勤, 殷睿, 等. 中国森林生态系统凋落叶分解速率的分布特征及其控制因子[J]. 植物生态学报, 2014, 38(6): 529-539. Dyer M L, Meentemeyer V, Berg B. Apparent controls of mass loss rate of leaf litter on a regional scale[J]. Scandinavian Journal of Forest Research, 1990, 5(1): 311-323. 陈法霖, 江波, 张凯, 等. 退化红壤丘陵区森林凋落物初始化学组成与分解速率的关系[J]. 应用生态学报, 2011, 22(3): 565-570. 彭少麟, 刘强. 森林凋落物动态及其对全球变暖的响应[J]. 生态学报, 2002, 22(9): 1532-1544. 魏强, 凌雷, 柴春山, 等. 甘肃兴隆山不同演替阶段典型森林群落的凋落物动态[J]. 南京林业大学学报:自然科学版, 2017, 41(5): 27-34. 魏强, 凌雷, 张广忠, 等. 兴隆山森林群落不同演替阶段的结构特征[J]. 南京林业大学学报:自然科学版, 2015, 39(5): 59-66. 吕瑞恒, 李国雷, 刘勇, 等. 不同立地条件下华北落叶松叶凋落物的分解特性[J]. 林业科学, 2012, 48(2): 31-37. 武启骞, 吴福忠, 杨万勤, 等. 季节性雪被对高山森林凋落物分解的影响[J]. 植物生态学报, 2013, 37(4): 296-305. 李雪峰, 韩士杰, 胡艳玲, 等. 长白山次生针阔混交林叶凋落物中有机物分解与碳、氮和磷释放的关系[J]. 应用生态学报, 2008, 19(2): 245-251. 査同刚, 张志强, 孙阁, 等. 凋落物分解主场效应及其土壤生物驱动[J]. 生态学报, 2012, 32(24): 7991-8000. 李艳红, 罗承德, 杨万勤, 等. 桉-桤混合凋落物分解及其土壤动物群落动态[J]. 应用生态学报, 2011, 22(4): 851-856.